Wormtec worm farming and vermiculture has been developing liquid organic worm extract microbial fertiliser and worm based soil improvers for over ten years now, our worm extract fertiliser is biology based. Biology based now this is where I believe the future lies in rebuilding depleted Agricultural soils. Are You Struggling with Soil Compaction? Both machinery and foot traffic from animals cause compaction, but the biggest cause is long term and over use of synthetic fertiliser, soil compaction and killing off soil microbial populations is caused by synthetic fertiliser and chemical abuse to your soil. Mechanical de-compaction. Trying to beat soil compaction by a mechanic means is not efficient or sustainable as all you really achieve is the wearing out of tractors and ploughing equipment, you do break up the surface layer, but you just push the compacted layer further down into the soil profile, whilst wasting time and lots of diesel and increasing your operating costs. By utilising beneficial soil microbes in an easy to apply liquid that also contains plant available nutrient in a chemical free organic form we are able to start the job of de-compacting, detoxifying and rebuilding our agricultural and garden soils. Soil microbes live on each and every soil particle in a healthy soil and open up the pore space between the soil particles; this then allows easy access for oxygen and moisture to penetrate into the soil profile, this also allows the plants roots to go down further into the soil profile after these compacted zones are opened up by soil microbes. By reinoculating your soil with microbial fertilisers you rebuild the microbial numbers and re-introduce microbes that have been killed off by synthetic fertilisers and chemical abuse. As a Biological Control? Are Your Crops Constantly Under Attack from Pest and Disease? As synthetic fertilisers kill off microbes, soils with low microbe numbers, will be unable to out compete the diseased organisms both bacterial and fungal, you are then forced into treating with more chemicals that also have a detrimental affect on your soil and microbe numbers. 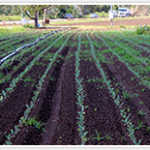 The biology contained in our liquid organic worm extract also acts as a bio-control helping to protect the seeds, seedlings and plants from both pest and disease attacks, by helping to increase plant brix levels and supplying the nutrients and minerals in a soluble plant available form, the microbes will also consume disease spores from the soil and crop when in good numbers. Build the life in your soil and it will build soil health. Rebuilding soil microbe numbers is the key to soil fertility, if you are seeing mineral deficiency or pest attacks on your crops or plants it can always be traced back to the soil, don’t treat the problem you see on a plant, fix the problem once and for all, by repairing the soil. Rebuilding Agricultural Soil and Fertility. The first step to rebuilding our depleted soils is rebuilding the life that was once in our soils, we should look at our soils as the biggest asset we have, without healthy fertile soils cost efficient and sustainable farming is impossible, imposing detrimental farming practices on our soils is the first step to non profit farming, If you look after your soil the soil will look after you, both financially and sustainably. We should never subject the soil or the life in our soils to detrimental farming practices we should endeavour to promote the life in our soils, by doing everything in our power to promote soil health. Feeding the soil organic matter to feed the microbial population, so the microbes can take care of the soil health and fertility for us. With chemical fertiliser use over watering or heavy rain leaches or washes the synthetic fertiliser down through your soil profile and away from your crop, this is a waste of resources and is unsustainable long-term. How Do I retain more moisture in the soil Profile? Microbes coat each soil particle with a mucus layer that absorbs water this retains more moisture in the soil profile, also because the microbes open up the soil and allow more moisture deeper into the soil profile more water is stored for your crops use, with far less evaporation. How do I break down crop stubble? Crop stubble is broken down by microbes and turned into humus or plant food, the soil microbes and worms will also consume and eliminate any disease organisms contained in this crop stubble, but with synthetic fertiliser use and chemical abuse on your crop and soil you kill off the microbe numbers and are left with crop stubble that contains disease spores that will attack your next crop if planted into. Crop stubble can not break down with out decomposing microbes, so this organic matter just lays on the surface of the soil. Good numbers of earth worms in your soil are the best indicator of a healthy soil, Why do most farms have very few worms if any in the soils, most people believe worms eat organic matter, when in fact worms eat microbes. so if your using synthetic fertiliser, and chemicals your actually killing off the soil microbes once the microbes are gone so will the worms. Make sure there is organic matter in the soil (yes this is for the microbes to eat) and apply our worm extract fertiliser as its microbial based, once you have built good numbers of microbes your worm numbers will return. Soil Ph; Should I know mine? Yes. Soil PH is critical and basically controls the soil function, as soon as your soil PH swings away from neutral and gets above 8 and below 5 your soil microbe start to go dormant, so once this happens your nutrient cycling stops, also mineral availability is at its largest around PH 6.4 so this is where I like to have my soils, as your PH swings you also get chemical lock up in your soil, so they are there but unavailable for your plants to use. By reducing synthetic chemical use and building soil health you can build microbe numbers and rebuild your soils for more sustainable farming whilst reducing your costs. Here at Wormtec worm farming and vermiculture we have developed world leading technology in extracting soil microbes from high grade worm castings and composts. This technology is only available to Wormtec worm farming and vermiculture as we have designed, built and perfected this technology ourselves over the last 10 years. The result of 10 years of research and development is Wormtec Worm Extract Liquid Organic microbial Fertiliser. Only available direct from the producer, shipped Australia wide direct to farmers and gardeners at a rock bottom price with full customer support and assistance direct from the producer.